Tennessee Promise currently serves as both a scholarship and mentoring program focused on providing last-dollar access for students to attend any of the state of Tennessee’s eligible institution offering an associate’s degree program. As the educational role of community colleges in Tennessee expands, so does the role of workforce development. Over the past year, Strongwell has encouraged local educational institutions to share the opportunities within advanced manufacturing with its students and educators. Recently, high school students from Northeast State’s Career Discovery Program visited Strongwell to explore the importance of workforce development within the community. As a result, over a dozen educators and students were exposed to over ten career fields within their three hour visit. Wanting to illustrate the plethora of career pathways available within advanced manufacturing, students were grouped by their interests. In one group, students were exposed to engineering, industrial maintenance, research, fabrication, welding, 3D printing and design. In the other group, students were introduced to aspects of business, management, marketing, IT and data analysis. Upon the students’ arrival, Strongwell engaged in a discussion regarding continuing need for public/private sector involvement in bridging workplace expectations and career trajectories. 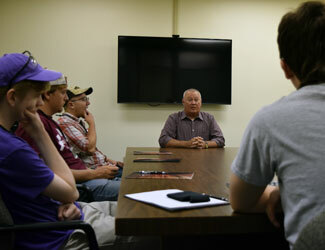 After their departmental tours, students had the opportunity to address specific questions at a roundtable meeting with Barry Myers (Corporate Marketing Manager). Students were most interested in: how manufacturing careers mature, fields of study, business headwinds, economics and differences in price versus value. Many thanks to Karrianne McPheron (High School Coordinator Career & Technical Education-Northeast State) and Chelsea Rose (Coordinator of High School Programs-Northeast State) for organizing this event on behalf of students from the following high schools: Dobyns Bennett, Elizabethton, Sullivan East, Sullivan North, Sullivan South, Tennessee High and Unaka.